Some films just seem to be made for adapting to a live performance onstage. The characters are strong and sympathetic, the story is emotionally powerful and the music is amazing. Disney’s Frozen has it all. 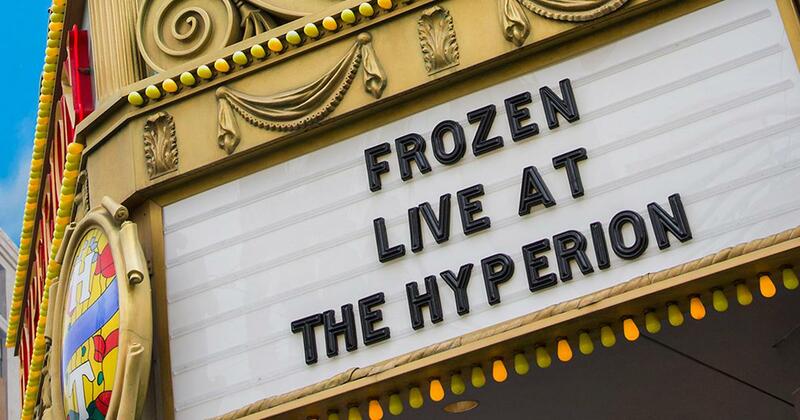 Which is why it has inspired a brand-new live stage spectacular—Frozen—Live at the Hyperion which debuts this May at the Hyperion Theater in Disney California Adventure® Park at the Disneyland® Resort. “We knew if we were going to create a new live musical at a Disney Theme Park, it would simply have to be Frozen,” says Dana Harrel, Creative Portfolio Executive at Walt Disney Imagineering. But adapting the film for the stage required careful—and very creative—thinking. “There are things you can do cinematically—such as character close ups or sweeping scenery shots—that you can’t do onstage,” Harrel explains. You also can’t replicate howling blizzards or a towering ice palace that appears from thin air. “Finding the right talent was crucial. Live theater amplifies and intensifies your emotions because you are watching the performers bring the story and songs to life right in front of you,” says Harrell. Olaf was another character who required a very unique skill set. “Olaf is an actor manipulating a puppet, so we needed performers who could do puppetry, dance, sing and hit that high note at the end of ‘In Summer,’” Harrel says. No easy task. But how do you handle such spectacular scenes as swirling blizzards like the moment Elsa creates her towering, glistening ice palace? According to Harrel the answer is that you don’t try to replicate them as they are seen in the film. Instead you find ways to theatricalize them. And that is just what Broadway director, Liesl Tommy, did. So from the moment the music begins, audiences will find themselves drawn into and even surrounded by the world of Frozen. Stunning projections paint a palette of colorful effects on every side. A giant staircase rises from the stage floor, pushing out over the first four rows of the theater, and an enormous crystal chandelier sparkles overhead. But because we don’t want to diminish the impact of what you’ll see, we want to keep some of the details a surprise. Let’s just say that amazing things happen on the stage, above you and all around you.